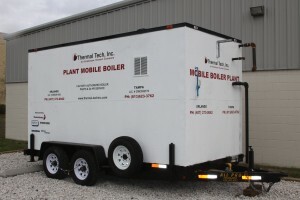 If your boiler goes down, we have you covered with our Mobile Boiler Plants. We maintain a number of trailer-mounted steam boilers for rental at times of temporary need or emergency shut-downs. Enclosed trailers house the boiler, boiler feed system, and water softener. The rental units can be fired with natural gas or No.2 fuel oil. 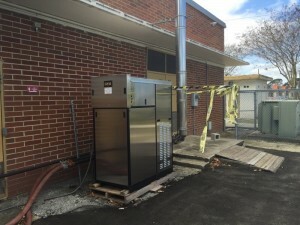 Other boilers, like this RBI 50 hp hot water boiler, are suitable for outdoor locations. 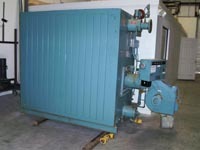 Should you require temporary steam, contact Deron Keiter at sales@tti-fl.com. 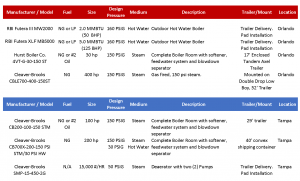 Thermal Tech, Inc. receives and reconditions Cleaver-Brooks boilers for resale. Inventory fluctuates, so contact us with your size, pressure, and fuel needs.